Last fall, we told you about a 20th anniversary multimedia collection from the Music Maker Relief Foundation, a North Carolina-based non-profit record label focused on supporting struggling traditional southern musicians by providing everything from instruments to performing and recording opportunities to day-to-day essentials like medications and heating oil. 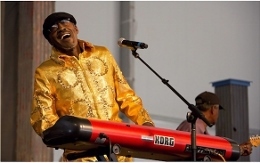 Among the many artists Music Maker has assisted over the years is a colorful character from the Carolinas by the name of Ironing Board Sam, who earned his nickname in the early 1960s by strapping his keyboard to an ironing board so he could carry it around the stage. Born Sammie Moore, the 75-year-old musician/inventor became famous for his stunts throughout New Orleans, which included performing underwater in a giant homemade aquarium or accompanied by a toy monkey playing a drum machine, as well as floating over the city in a hot air balloon, operating a party boat, and riding around in a Cadillac fitted with crystal chandeliers. Recently, Sam signed with Big Legal Mess records, where he’s slated to release his debut album Super Spirit in early October, co-produced by Bruce Watson and Jimbo Mathus. Here’s the album’s energetic lead track – “Baby You Got It” – to help get your weekend off to a grooving, soulful start, with horns and background vocals adding an old-time sound to Sam’s frenetic keyboard melodies. As Sam himself advises in the song: “don’t keep it to yourself”! This entry was posted in Songs and tagged Ironing Board Sam, Jimbo Mathus, Music Maker Relief Foundation. Bookmark the permalink.